Olympics, Schmolympics – We’re Getting A SoapBox Race! 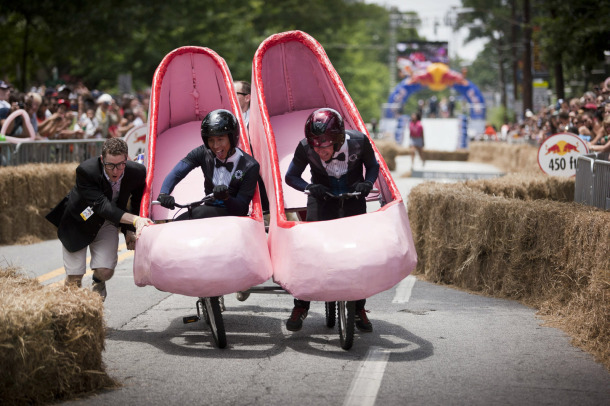 UStreetDirt has learned that representatives from Red Bull and Capital Sports Ventures – a self-billed “sports properties accelerator” – have met with representatives of the Meridian Hill Neighborhood Association regarding their plans to stage a Red Bull Soapbox Race in September of 2014. The race would be staged down 15th Street between Euclid and Florida which, considering that turn right around Belmont, could be awesome. Or awesomely hilarious. Which, we gather, is really the entire point. Looks like they’d fit right in here. If everybody agrees and all comes together, this would be the second Red Bull-sponsored “sports” event in or near our fair city, and the first on the ground. This September 21st, the first D.C. Flugtag event will be staged at the Southpointe Waterfront at National Harbor. Much like the Flugtag, the real competition in Red Bull soapbox races is in making the oddest, strangest contraption possible, with extra points for a spectacular fail. Think Miss Adams Morgan but with wheels instead of heels. Of course, the race would come with a few bumps. Parts of 15th Street and Florida Avenue would see minor construction as the viewing stands are erected, and the day of the race portions of the streets would be shut to traffic with around 80 or so parking places removed. Still in all, however, it seems like a minimal cost for such a colorful event. And, as Meridian Hill Neighborhood Association president Christina Parascandola tells us, the soapbox race would be a great example of how to use and under-utilized treasure in the hood – Meridian Hill Park. “One reason for supporting this event is that it will make it easier to hold special events in the park, like symphony concerts and movie nights, given that Red Bull will have established a blueprint for cutting through the red tape,” she says. Like the conversion of the cursed space that was formerly Cada Vez into an multi-purpose Indian cultural center, this just sounds like a great idea with lots of upside and very little downside. One thing, however: those hoping to down the vodka-Red Bulls will have to do so elsewhere that day: there will be no alcohol served at the race. This is going to be a short post, as we and others will no doubt be writing more about this in the near future. We’ve just confirmed that 1438 U Street – the building that once housed “Cada Vez” and several other ventures that never really took hold – is being purchased by the Indian embassy for use as an Indian cultural center. Matthew Greeves, vice president at EJF Real Estate, tells us that the cultural center hopes to have various uses: classes, speakers and performance and art events in the large open first floor area, and daytime office in the higher levels of the building. He also says the embassy hopes to work with a highly-regarded architect to restore the buildings impressive exterior and create the best use of the large indoor footprint. This is exactly the sort of development, or re-development, we’ve been hoping to see. Re-using existing structures in the neighborhood to bring daytime traffic and multiple uses without turning it into yet another bar or restaurant. We’ll post more in the coming days, but from what we know right now, this is a project we can enthusiastically get behind! 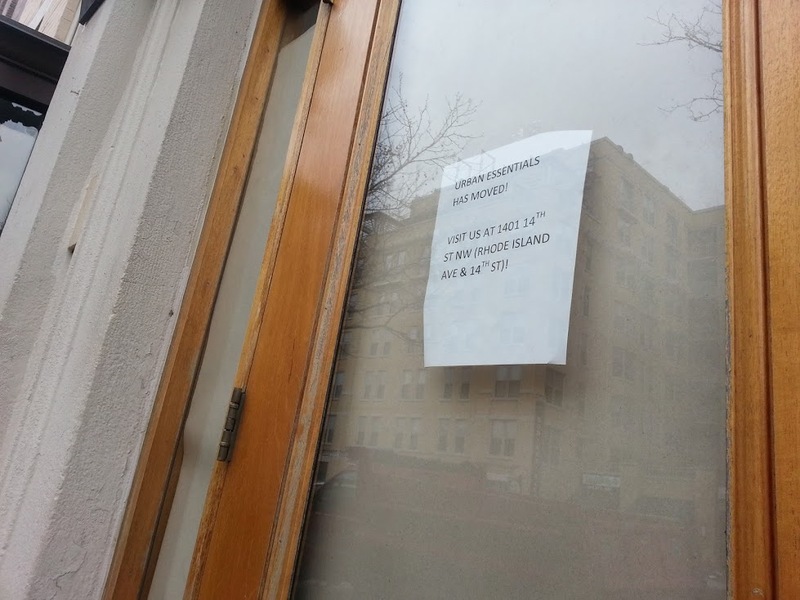 After years of discussion, and now months of official debate, the U Street liquor moratorium’s fate rests with the DC Alcohol Beverage Control Board, or ABC. This Wednesday, the Board heard public testimony – the last it will hear – on the matter, and will render a decision in the coming months. What that decision will be isn’t at all certain – David McAuley at Borderstan tried reading a few selected tea leaves – nor is it all or nothing. By statute, they can accept it as is, reject it entirely, or modify it to include geographic or establishment carve outs. It is in their hands. “Clearly you’ve reached the threshold,” several board members told the multiple panels of proponents, but then went on to question supporters about the possible negative effects of the moratorium, and opponents about possible blind spots as to the throngs of liquor-fueled revelers every Thursday, Friday and Saturday nights. Of the seven board members, four were in attendance, but only two took the opportunity to question witnesses. For supporters and opponents alike, the moratorium is an issue that stirs a lot of emotions – hopes, fears, optimism and anger. We’ve written before of the need for everyone in affected zone to make an effort to specifically listen to those they disagree with; to try, even if for a moment, to empathize with their neighbor they disagree with, to stand for a moment in their shoes. We’ve also seen more than enough name-calling and vitriol to last for several years. For those who have genuinely tried to listen and understand, thanks. For those merely interested in hurling invective and bile, you have shown your true colors. I was a founding member of the SDCA, but soon came to realize that the group was not wholly suited for me and left. It was created in an effort to give residents – specifically, residents – a voice in a neighborhood where the ANC 1B had largely failed to do so. Along the way there have been good works and there have been errors; to the degree that I contributed to either will be judged by others. Specifically, my partner Craig and I offered to help found the group as a way to get leverage with developers more interested, unsurprisingly so, with their own new buildings and bottom lines than the impacts on neighbors. My personal hope was to create a path to getting to yes; not just saying “NO!” to all developments, but engaging with them to craft and create the best outcomes for all. Our early work on “Wallachzilla” was a high point, demonstrating that development is not all or nothing, but best when everyone is willing to give a little. As such, I began by thinking discussion of a moratorium was a distraction. Certainly, the idea has floated around living rooms and hearings for years, going back to the start of the real explosion of bars and liquor licenses around 2006 or so. But was this our lift, I wondered? Was this really needed? Since my partner’s moving to the neighborhood in 1988 – when the ugly Rite Aid was actually a building that one day, with no notice, a developer decided to knock down – U Street has been a place that everyone likes to think they’ve discovered. When little more than Polly’s and Ben’s were open, it was a frontier. When 930 and Black Cat moved in, it was dangerously cool. When State of the Union and Republic Gardens opened, it was a gritty escape. When the Hilton brothers opened The Gibson, it was urban chic. All along the way, everyone who grows up, visits or moves to this special place feels it’s part of who they are and what they want. So I completely understand that, for many of those new to the neighborhood, they feel as though they’ve discovered something new, an urban playground built and sustained in some small measure by them. And for many of those newer to the hood, a large part of that play is the lively restaurant and bar scene. As an older (literally and also in a long-time sense) resident, I, too, think this area is special. Is it beyond great that one of the best Japanese restaurants now lives in little more than a row house around the corner? Yup. Is it ideal that we can walk to our vet, our grocery store, or a tailor in just moments? Duh. Is it way awesome that when friends visit, we don’t have to go far to find a cold one? Again, yes. Yet, there is a but. With an ANC that largely abrogated its responsibilities in working to see that residents were represented amid the explosion of bar stools and $12 dollar martinis, residents became overwhelmed. For those who thought attending the so-called “listening session” was “a waste of time,” as one speaker stated it, imagine attending meetings every night with prospective bar owners and restaurateurs or sub-committee hearings on development and still not having half enough time to address them all. With closing hour on Thursday, Friday and Saturday (increasingly Sunday as well) imagine your sidewalks spilling over with yelling, screaming, fighting, urinating, trash, traffic and Lord knows what else. Imagine two neighborhoods: one that looks one way in the daytime with little more than fast food (a “daytime dead zone” as someone told the ABC) and one group of faces, and another that looks completely different at night. As the bar culture has accelerated, those residents most intimately affected by it have been marginalized; in some cases by developers, in others by an inert ANC, and most distressingly, yet others by the new neighbors themselves. “Maybe you should move to the suburbs” goes a cleaned-up comment I and my partner have heard entirely too much. Maybe people should think a little before they open their mouths. Engaged community members have sincerely offered alternatives to a moratorium to address the problems. More lights, more police, faster response by ABRA, taxi stands, an assertive enforcement of the arts overlay are several that were offered just Wednesday. And these are by and large good ideas: more police? Yes, please. More traffic lights and taxi stands? I’ll take two. But none of these things will happen anytime soon. In the meantime, the neighborhood is to simply accept more talk, more hearings, more time ticking by month by month, more exhaustion until finally nothing happens…and more and more liquor licenses. It was interesting that on my ABC panel, evenly split between proponents and opponents, none of those opposition voices could say there is the possibility, even theoretically, that there may come a time when possibly there are too many bars and restaurants for the neighborhood. There are, and we have reached a kind of tipping point in that matter. A few will not be satisfied until every door and shop finds fabulous food and creative cocktails, but I think cooler heads understand that a neighborhood is more than just a playground. It is for everyone: senior citizens, young couples, children, visitors, singles and group homes – everyone. The changes of even the past three years we intimately feel here, and we are overwhelmed. I don’t like the idea of a moratorium – even though it can last as little as a year and be elegantly nuanced with lots of carve-outs – but I like less the idea of the specialness of this neighborhood, our neighborhood we all share, draining away into a boom-and-bust, only for some mono-culture fueled by liquor. What we are saying is that we are overwhelmed, and there is nothing that can help us catch our breath other than the moratorium. That is our reluctant plea: please help us now before we lose any more of our shared special neighborhood. For the record, the three community organizations directly affected by the proposed moratorium – the SDCA, the Meridian Hill Neighborhood Association, and the Dupont Circle Citizen’s Association – have all voted to support the moratorium. First off, I hope nobody got their hopes up. Over the last week or so, a large portable “Pod” container had been parked in front of our house on Wallach. It wasn’t ours, yet I can’t help but suspect that a few of you faithful readers may have put two and two together, erroneously, and thought we were moving. Sorry to disappoint. It wasn’t ours, but a neighbor’s just about four houses down. He and his wife and their happy slobbery dog were great neighbors. But they have had enough of the unending late-night street party that our corner of the neighborhood has become. They live elsewhere in the District now, as do several others who have left recently. “It’s just too much, and we’re the ones feeling it most,” said another neighbor as we bumped into each other on the street recently. “Nobody else seems to understand.” She and her husband are also debating a move. Unlike the recent joint ANC “listening session” – in which hardly anyone, including the ANC commissioners present who already had their minds made up, listened to anyone else – it seems there are several things that can be learned about where the neighborhood is moving, but only if people listen to each other. I was there, and heard many voices; although to be fair, those speaking seemed less “diverse” as one speaker noted and more homogenous than a walk around any four blocks around here. Regardless, there were generally three types of comments – from liquor moratorium supporters and opponents alike. First was the appeal to good policy. Impact on crime, jobs created, long-term area growth; appeals to reason, basically. Of course, no serious policy discussion is premised on :90 second time limits, and by and large a lot of those arguments marshaled on both sides seemed rather spurious. That’s OK; it’s really no different than how committed partisans in our larger political contests engage. Second was the “too blunt” argument, whose theme and variations were essentially “Yes, we can see how some of these things are getting a little out of control, but the moratorium is too blunt an instrument. Let’s just use existing laws to go after the bad actors.” Which would be fine, noted opponents, if it were possible. Personally, I suspect that if anything could have been done in the past under the existing laws, it would have. As in: if only the ANC 1B actually worked and wasn’t a complete mess losing filings and forgetting meetings and just plain making crap up, but alas, we know different. And the truth is that a moratorium is a blunt instrument. Perhaps not a cudgel, but certainly as fine as a hammer. The third general sentiment seemed to me, at least, the most honest. Namely, that many new residents moved here specifically for a certain kind of urban lifestyle, and that those pushing the moratorium were attacking that life, and as a result, the new residents in turn. In other words: saying you don’t want any new bars is like saying you don’t want me. This candor, it seems, deserves some attention. The moratorium was never my thing. It was an issue I could have (and did) go back and forth on. The District regulations it’s based on are cumbersome and complicated and, while not as absolute as some worry, just too ponderous for anyone’s good. Thus, winning arguments aren’t really based on policy or facts or convoluted processes, but emotional appeals. In this case, a large segment – although I’m not convinced a majority, despite the dog-and-pony show – of residents share that emotional sense that the moratorium is somehow an attack on their values, their choices and at some root level, who they are as individuals. This, I sense, puts this moratorium in a different space than the previous successful efforts in Adams Morgan, Georgetown and Cleveland Park. There, the populations were largely stable, there was little or no new influx of residents, and many of those drinking there and causing problems were from other areas of the region. Here, however, there’s a new building going up every week, and many of the younger, relatively successful newcomers are the ones rushing the tables and bars counters. I really do get all that, as well as earnestly respecting those who let feelings be their guide on this issue. Which brings me to what has been lacking – at times shamefully so – in much of the discussion from those vehemently opposed to the moratorium: any attempt at empathy or understanding. When my partner spoke of the “online jihad” aimed at those proposing the moratorium – and was booed and hissed by those gathered to ‘listen’ – this is what he was speaking of. “Tyrants,” “busybodies,” “old nobodies,” “idiots,” “fascists”; these are just a few of the many more choice terms moratorium opponents have flung at proponents. And save one exception, with the courageous conviction that online anonymity provides. In fact, it was frequently the anonymous commentors here and elsewhere that publicly singled individuals out by name and address; bravely while remaining cloaked themselves. Truly profiles in courage. Boo and hiss that. Understanding and community-building work both ways, which is something this neighborhood is in desperate need of. Just as some opponents felt attacked personally by this issue, so, too do many residents who have watched their life choices be disrespected in puddles of vomit, exponentially more trash, drunks arguing and urinating right in resident’s front yards and so on with the explosion of establishments serving liquor. Those neighbors moving out of the neighborhood aren’t happy to do so; several have commented they feel the neighborhood no longer cares about them and nobody is willing to listen. Successful communities work to build bridges, not burn them down. No individual or group should get everything it wants, and to hell with everyone else, as some seem to believe. We all must live together. In the end, communities change. They follow at times unpredictable paths of both opportunity and loss. Ultimately, there will come another issue, another debate, where those who find themselves feeling in the superior position today will need those they once disrespected and called terrible names tomorrow. It’s important to remember that, especially in this town, memories are long. Only fools choose to make enemies they don’t have to. 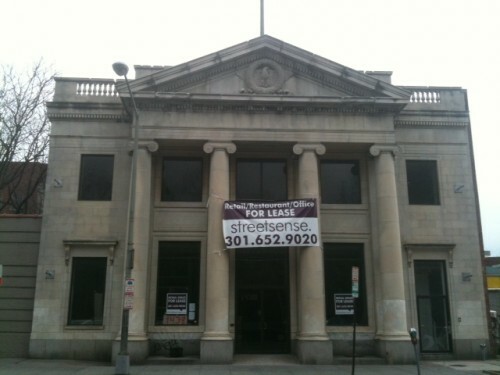 This story begins and ends with an empty building at 1330 U Street, and all its possibilities. Before there was a Gold + Williams or Vastu, Muleh or Room and Board, there was an empty building on U street, right by what used to be Pollys, now Desperados. At the edge of the area’s renewal, a new store opened up that proved to be a treasure on the street – Urban Essentials. Sure, they had a stunning offering of contemporary furniture, somehow mixing comfortable and chic, old and new. But just as much, Urban Essentials played a role in opening up the neighborhood, giving residents both a store they needed and an early step in rebuilding U. They were, in short, a company that got it – quality interior design and purposeful community building. When they opened rents were *relatively* inexpensive in the area. But with every new restaurant and bar came more and more landlords looking for the quickest way to make the most money possible. Say what you will, but food & beverage service – notably the latter – make large bill. You know what happens next. Several businesses, more and more, begin closing as landlords, envious of the higher rates that bars can command, begin pushing out those who had helped make the area desirable in the first place. And that’s what exactly what happened at 1330. The landlord raised the rates for Urban Essentials, even though the owner was public in his desire to remain in the neighborhood. When that failed, he tried to negotiate with JBG, the firm seeking to build yet another apartment building right next door. That, too, went nowhere. UE eventually relocated, down to 14th near Rhode Island Ave., and the neighborhood had yet another victim of mono-development; namely, an over concentration of one type of business in a concentrated area. Knowing exactly who was interested in 1330, a restaurant developer with some success in Georgetown who wished to open a new restaurant & bar called The Fainting Goat, several local residents (as in those right behind the proposed establishment) met with the new team to try and negotiate a settlement agreement, or what used to be called the Voluntary Agreement. Here the residents and the entrepreneur negotiate basic things such as hours of operation, outdoor seating, live music, trash, noise and parking issues. Just what being good neighbors is all about. And in fact, according to both sides, while agreement wasn’t final, negotiations were going very well, were civil, and close to agreement. At the same time, however, a few voices on the Internetz began a plaintive cry, saying in essence: “What ever are we to do with an empty space in the heart of U?” Here, the idea goes, was someone who wanted to make use of an empty space…if only those certain nasty, terrible blah blah blah people would stop standing in the way of everything! I guess for these pious few the idea of citizen input and democracy means little. Regardless, here is where the tale turns sadder still. Enter the ANC 1B. For years now, some parts and some commissioners have valiantly pressed forward, working hard at jobs most people would never willingly accept. Unfortunately, other parts, and other commissioners, have largely slept at the wheel, making up rules and procedures as they go and letting important agenda items simply fall through the cracks. This has been known to the very small number of committed residents on all sides of any issue who regularly attend not just the big meetings, but the innumerable sub-committee hearings. (Lesson: attending hearings is not much fun.) But as last Thursday’s public meeting laid bare, the ANC 1B is in serious need of repair. Borderstan has an excellent summary of the rumpus that ensued, but in short, nobody seemed to have any firm knowledge about specifics of the proposed settlement agreement – several members said they never even saw it – or any votes that may or may not have been taken in the ABRA sub-committee. Unfortunately, the Fainting Goat was caught in the confusion, leaving everyone concerned, on all sides, discouraged. Here’s the truth: for years, the liquor licensing sub-committee has largely failed to work, at times being uncertain of who actually sat on the board, failing to muster quorum for meetings, and in a number of cases, simply letting license applications pass without any hearing or action at all. Last Thursday is only the latest example of mismanagement. If a government or private corporate board acted in this way, the stakeholders would be justifiably upset and demand improvements. In an odd twist, however, a few have taken their fight online to blame those who pointed out the errors, and who were actually close to sealing the deal with the Goat. Easier, I guess, to just vilify than lay out the truth of the matter. And now, nobody trusts anybody else. Some supporters of the Goat (I number myself a supporter, by the way) want to pick up the negotiations again, but noticing the chaos at the ANC have been forced to take the only action they can; to oppose the license for the moment so that everyone and all sides will negotiate in good faith. Can locals trust an ANC that appears to simply make up votes or agreements? Can license applicants trust either supporters or opponents who seem to be fighting a larger battle? Can people on all sides stop making claims – much like Limbaugh makes of Obama – that their opponents simply want to ruin the neighborhood, only before telling them to move? That, perhaps, makes me saddest of all. It’s unfortunate that during serious civic debates, some parties choose to resort to the age-old tactic of bullying. Specifically, in the neighborhood debates about development, construction, liquor and entertainment and the qualities that most enhance a neighborhood’s livability, some continue to try and bully their neighbors with the epithet N***Y. As we’ve noted before, there is no difference between slinging that term at someone and walloping them with some other collective slur. The terms are repellent, they exist solely to intimidate through power, and are simply unacceptable. Too bad, then, that some new voices from outside the neighborhood have picked up the bully mantle once again. In their effort to build their vision of a most livable, 21st Century city, they seek to limit, or even prohibit, local voices in having a say in how to shape what their immediate neighborhood is, and what it will become. To all those who want a more “livable” city: we stand with you. Livable in all its sense: in neighborhoods that provide daytime business, encourage local merchants of all sorts and nurture all the amenities that give a neighborhood its character. We’ll go a step further, as we have for two years: all those wishing to see more entertainment establishments throughout our city – particularly in those areas where they are few and far between – then your fight is our fight. There are still too many areas throughout our city where residents wish for a walking distance life: a decent, fresh grocery, a good wine store, a tailor, a couple pubs, a theater and the rest. So, the very best way to encourage exactly that city-wide development where it’s most needed is to support the 14th and U liquor temporary moratorium. Proprietors and business people aren’t going to simply stop opening establishments throughout the city because one small area said: “Slow it up.” Just the opposite: under-developed areas, which are often cheaper, will become more appealing and new ventures will begin. Win-win. However, if you simply want another area of your city – someplace that literally isn’t your backyard, and not where you live – to host all the bars and nightclubs you crave because it’s just so convenient, and in so doing take away the real neighbors’ voice in giving thumbs up or thumbs down, then that’s not civil. It’s disrespectful. More over, if you’re so bankrupt of actual arguments and assertions that you have to resort to name-calling, then you are a bully. Bullys are not welcome in our neighborhood. 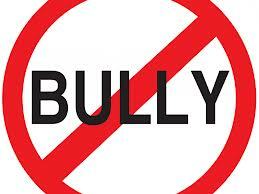 Bullies like to hide, call names, and generally behave in an arrogant and smug manner. There’s only one way to stand down a bully, and that’s by standing up. So, for the 100th time, we welcome a civil debate about the merits and faults of a temporary liquor moratorium in this neighborhood. All voices are welcome as long as they’re respectful. But those voices that try and silence those who live here are not welcome, now or ever. The ANC 2B met Thursday evening at the Reeves Center with a mixed audience turnout, but resulting in a surprise vote. On the agenda was support for both the JBG proposal, as it exists, for the U/13th Street 86 foot apartment project, and the PUD put forward to avoid the snarls of public review. The turnout was mixed, as usual, but not when it came to JBG’s plan. Not a single member of the public spoke in support of the project. Despite one out-going commissioner’s belittling of those who turned out, every member of the community that spoke registered opposition to the project. This Commissioner likes to say things like “despite your giggling…” or “other than the six people in the back…” in hopes of sidelining opponents to the proposal as it exists. For the record, I object to any public official belittling their constituents. It is offensive. Yet every time any public meeting has been held, as several community members pointed out, far and away the majority of voices have spoke out against the proposal, as it exists. In short: too tall, bad massing, poor meeting of the street, and no parking. Which, as I pointed out in my letter to Chair Myla Moss, does not mean opposition to the proposal as a whole. Without quoting at length from my public letter to her (ask her for it, it’s public record,) I and many of my neighbors “find much to like in the JBG proposal.” Yeah, you read that right. That, however, does not mean the proposal as it stands is ready for prime time. As I also said to Chair Moss: “Taking a month or two to address community concerns will make for a better building, and a better neighborhood.” Oh, that was regarding the L2 project, which everyone agreed upon, following adequate public input. But also this project, which suddenly every one seems to have to approve yesterday. While some will report Thursday’s vote as the ANC’s support for the project, it was explicitly – with the aid of Commissioner Zwerdling – contingent upon explict approval from DDOT that all residents of the apartment building – now and forever – would not be able to apply for on-street parking. This, following from precedent at the L2 development, and their garnering approval from the ANC. And even at that, the vote ended up being 5 for, 3 against and 1 abstention. Not in any way a full throated approval for 13/U. In fact, that very vote should signal to all concerned the continuing concerns about the proposal. As long as you assume that’s not just coming from six cranks in the back of the room. The proposal now goes to Zoning, and HPRB. Suddenly, 13th and U is looking a little shaky. To which I say: if you have to say repeatedly something isn’t a threat, it is. U Street Dirt · If you've got it, we want it.